Timothee Chalamet is in talks to star in Denis Villeneuve’s adaptation of Frank Herbert’s science-fiction classic Dune, as THR reports. Successfully adapting the 1965 novel may be sci-fi’s biggest white whale. Ridley Scott, Arthur P. Jacobs and Alejandro Jodorowsky all abandoned efforts to bring the multi-layered space saga to the screen. The quality of David Lynch’s 1984 version, a box-office disaster starring a floppy-haired, pre-Blue Velvet Kyle MacLachlan (and Sting! ), is still hotly debated today. Now, Blade Runner 2049 and Arrival director Denis Villeneuve is trying his hand at depicting the novel’s complex plot on film. Set in the distant future, Dune tells the story of a noble family who attempt to control the futuristic desert planet Arrakis, the source of a rare and invaluable drug called “the spice,” since (as Lynch’s film frequently reminds you) “he who controls the spice controls the universe.” The novel explores themes of politics, ecology, technology and religion, all through the lens of an epic, unearthly setting, making any adaptation ambitious and, more importantly, expensive. Chalamet is circling the role of Paul Atreides, the son of the ruling family who is cast out into the deserts of Arrakis. Coming off his Oscar-nominated performance in last year’s Call Me By Your Name, the 22-year-old actor (that’s right: he’s been legal to drink a whole year) has also had roles in Lady Bird, Hostiles and Interstellar. 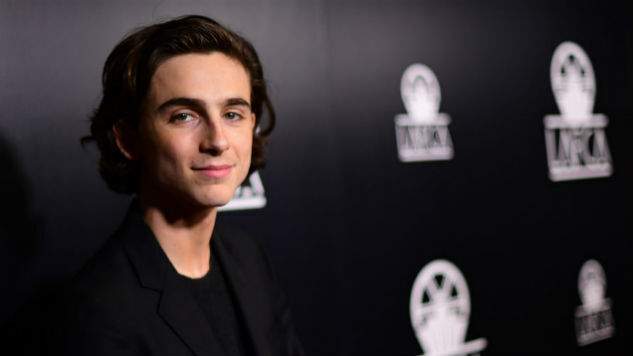 Apart from Dune, Chalamet will next appear in Greta Gerwig’s Little Women adaptation and Amazon’s addiction-centered familial drama Beautiful Boy, along with A24’s coming-of-age thriller Hot Summer Nights. As of now, Villeneuve plans to split Dune into at least two films. Check back for further updates as preproduction continues—as long as this version doesn’t run out of money, too.